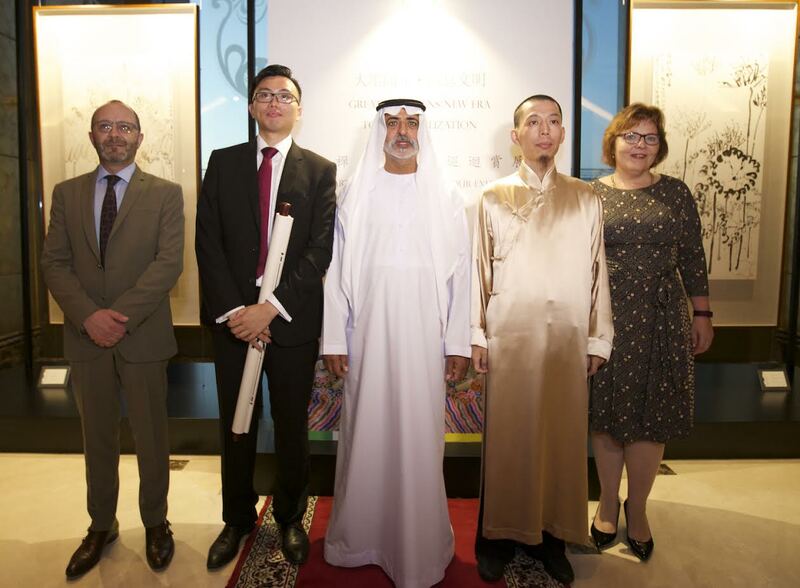 United Arab Emirates: His Excellency Sheikh Nahyan Mubarak Al Nahyan opened the exhibition of ink paintings and Arabic calligraphy by leading oriental artist, Shi Dachan. The artist will be showcasing his ink paintings and calligraphic pieces at the Emirates Palace from the evening of 29th of September to the 2nd of October 2016 and from the 5th to the 7th October at St. Regis Hotel, Dubai. Shi Dachan combines ink art, traditionally from Chinese culture to express ways to co-exist with one’s surroundings in harmony. Inspired by nature and calligraphy, Shi Dachan introduces classic and timeless pieces of contemporary art that sets its own cultural and heritage trends in Asia’s art industry. Mr. Oswald Wong, President and CEO of the China International Development and Investment Corporation Limited will be attending the event. He is particularly supportive of the Chinese national strategy “One Belt One Road”, which aims to link over 60 countries to enhance cross-border trade and investment with the ultimate objective of cultural exchange and economic improvement. UAE is naturally an important market given the new visa free free rule for Chinese nationals entering UAE and the exhibition is the first step towards initiating cultural exchange between the two countries. According to Shi Dachan, “Chinese calligraphy is very similar to Arabic calligraphy when it comes to attention to detail and accuracy. With increased interest from Ink Calligraphy lovers, it was only time before we ventured into the Middle East region to strengthen cultural ties with art lovers from the GCC and Levant. Respected UAE gallery owner, Salwa Zeidan of Salwa Zeidan Gallery is curating the exhibition. “As a monk, Shi Dachan’s work transmits spiritual energy and makes viewers look deeper for answers in his work. His fresh minimalist style blends well with the group of artists we represent, hence we felt important to introduce his art to our group of art collectors,” she adds. Sultan Bin Ali Al Owais Cultural Foundation will be inviting art and calligraphy enthusiasts amongst its members as a key supporter of exhibition. “Shi Dachan’s collection has an universal aesthetic, intended for a global audience and demonstrates the diversity found in current ink techniques. His style is used by the most admired and innovative practitioners aimed to create poetry with fluid and expressive ink tones,” adds Oswald. The paintings and calligraphy showcased in the UAE ranks among the finest in China and beyond, perfect as masterpieces in art galleries and private collectors residences. Dignitaries for the opening night of the exhibition hailed from the USA, Australia, China and the UAE, with the attendance of Diplomats, Art Collectors, regional Businessmen and regional media.